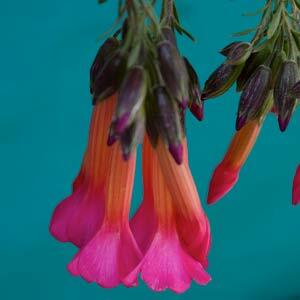 Much loved for the showy tubular flowers in spring, Cantua buxifolia is commonly called the ‘Sacred flower of the Incas’. Cantua species have flowers from white and yellow through to red depending on species. Most can make a good screening plant and can be cut back, all prefer a well drained soil. It is Cantua buxifolia with its tubular red flowers that is most commonly grown. As it comes from higher in the Andes than some others it does grow well in cooler and less humid climates. This is the national floral emblem of Peru and very attractive to nectar seeking birds. It is possible to grow this plant in containers, however it is best suited to position in the garden. C. buxifolia grows well in a sheltered sunny position. A humus rich moist soil is best and a little light pruning after flowering will help keep these plants in a more compact shape than they would be in the natural environment. Use a slow release all purpose fertiliser in early spring for good growth. Mulch around the plant to maintain a cool moist root run. Height – To around 2 metres in height. Position – Sunny, sheltered from hot winds and from very hot afternoon sun. Foliage – Mid to deep green, lance shaped. Flowers – Tubular orange to red with a bright pink skirt. Frost tolerant – A frost free position is essential. Drought tolerant – No, requires water in spring and summer, with less water in winter. Best pruned after flowering in spring to maintain a bushy compact habit. C. buxifolia ‘Pyrifolia’ has wonderful yellow flowers with white tips. C. buxifolia ‘Bicolour’ has golden yellow flowers with pink and white tips.